Omi is German and that is what we call our German grandmother! And Omi loves to cook. Here is proof and here is almost every meal she has made that I have eaten. I have missed a few meals like Tuesday night...but you get the point. Let me show you the feast(s). 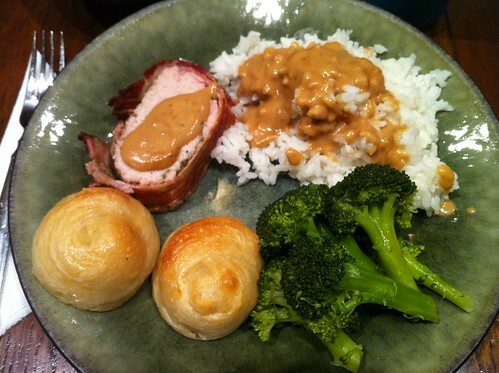 // Bacon wrapped pork (got this recipe), Rhodes rolls, steamed broccoli (my fav), rice & a yummy gravy! 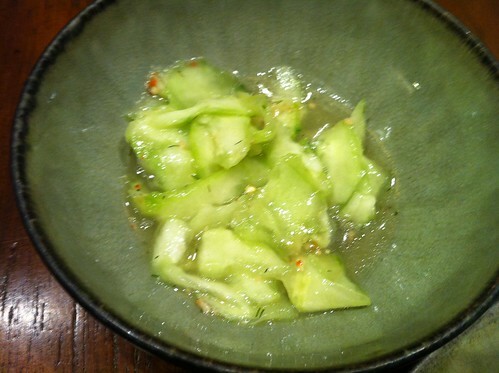 with... cucumber salad (got this recipe)! I remember eating this when I was younger at Omi and Opi's house in Alabama and not really liking it. Now I do! Guess when you get older you like more things? 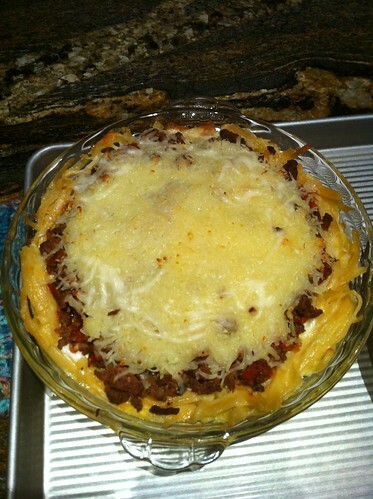 Got this recipe and this was ah-mazing! 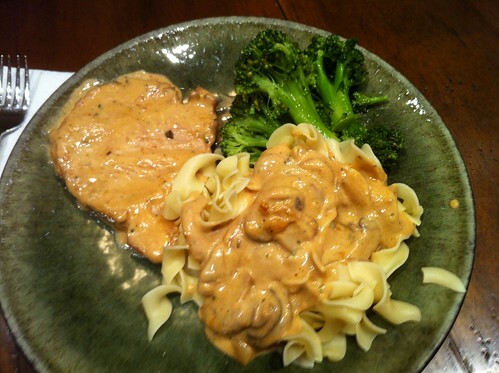 // Pork, gravy w/mushrooms, egg noodles, and broccoli! I need to learn how to make this gravy. 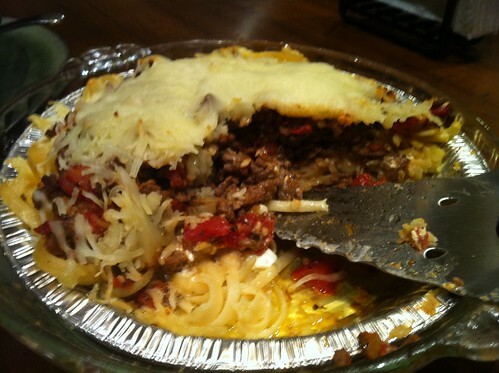 // Spaghetti pie! Now this thing is good. There are a ton of ingredients...need to get the recipe. Actually let me stop there and say that for the rest of the meals she makes. Now I won't have to type it here and there. 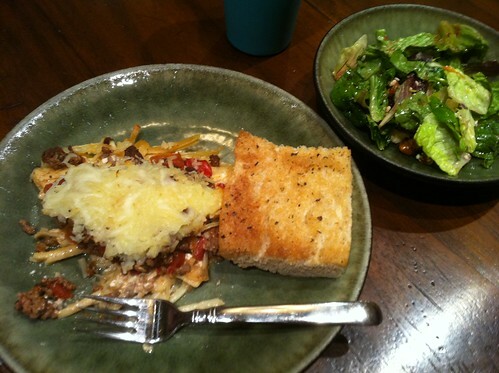 Spaghetti pie, garlic bread, and a fancy salad with raspberry vinaigrette! 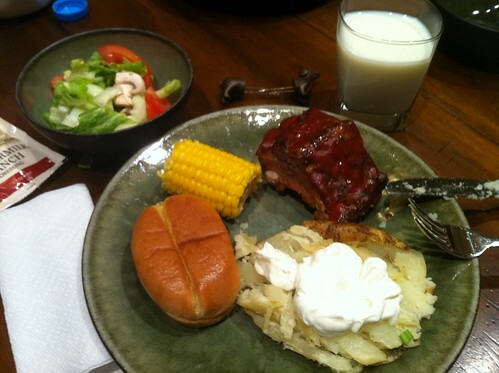 // Ribs, rolls, corn on the cob (see the weiner dog corn on the cob holders at the top of my plate?! ), a baked potato with chives, butter, and sour cream, and a great salad with tomatoes, cucumbers, celery, and mushrooms! 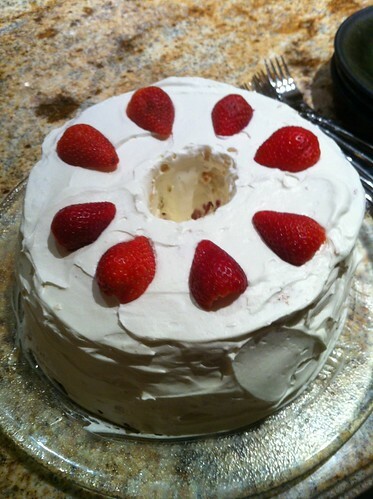 Angel food cake w/cool whip and strawberries. 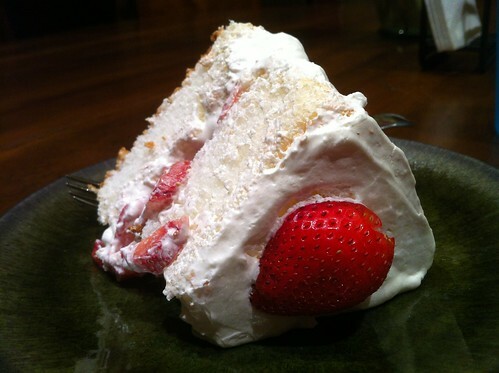 She had a layer of strawberries in the middle of this divine dessert. 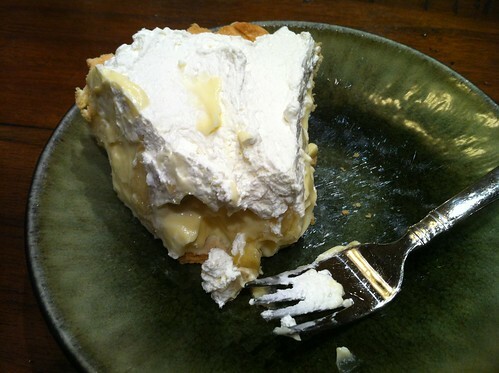 Usually I just layer em on top of the cool whip. No clue. I don't have a scale but getting one is on my to-do list hehe. But if you are serious, I guess maybe I have gained 1 lb...so sue me. And she'll be in town until mid-February...hehe. The food all looks unbelievably good! 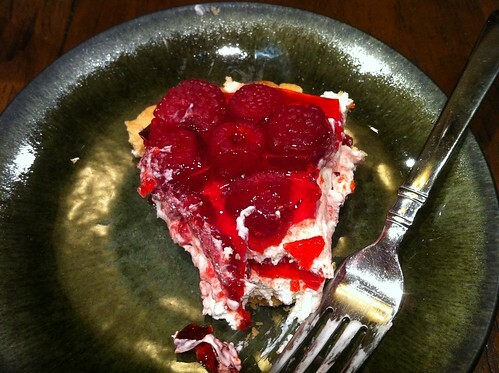 Favorite dessert... anything chocolate, Creme Brulee or red velvet! Oh lord, this is a lot of food! hahaha I love me some Angel Food cake. I want to come visit Omi! Her food looks delish! Oh boy, I want some of those desserts. They look delicious. I always gain weight when we go to visit family because there is always food available. At home I'm good at eating my 3 meals a day with maybe a late night snack, but with family the meals are all huge and there are always in between meals too. Mmm I Loooooooove food!! Probably a little too much :) Send Omi my way asap!! Yum! All this food looks delicious! Your Grandma is such a good cook! Oh my GOSH Ashley! THIS ALL LOOKS AMAZING!!! I am so hungry now...... ha! K thanks for your sweet comment on our baby news :) YOU ARE THE BEST ASH!!! My lunch was NOT satisfying just looking at all of this deliciousness! Yum, yum, yum to ALL! these pictures in instagram have been killing me! haha! 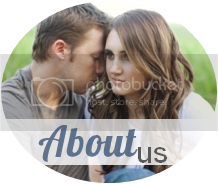 I love the new blog look! I haven't clicked over from reader to comment in a while I guess (sorry). And that food looks yummy! I've been pretty lazy in the cooking department lately. That angel food cake looks delish and wow what a variety of dishes! Thanks for sharing girl. I wish she was my personal cook. The food looks fantastic! Oh my goodness, all the food looks DECLICOUS! And the cake in the last picture is seriously making me drool right now!